The first ever international week of action for military-free education and research was held between 25-31 October 2014. This follows on from a day of action last year. Antimilitarists across the world took action to raise awareness, and challenge, the role the military has in education and research in educational institutions. This role gives them access to young people - to lay the groundwork for recruitment later in life, and to promote military values. Different groups used the week of action in different ways. Some challenged military presence in schools through direct action, some publicly debated the presence of the military in education, others showed films, wrote articles, and campaigned on social media. In Canada, students from Demilitarize McGill disrupted a conference on military space law. Students entered the conference equipped and made some noise! They held a banner reading “demilitarize,” chanting “a, anti, anti-impérialiste!” as they walked, interrupting a presentation titled “Law on space exploration and exploitation”. One activist said the purpose of the demonstration was to “disrupt their workshop sessions, and have a presence that they weren’t able to ignore in opposition to the ideological project of the training week.” Read more about the action in a press report here. In state of Spain, Alternativa Antimilitarista.MOC ran events, including film showings, and talks with Iraq Veterans Against the War member Wendy Barranco. Catalan group Desmilitaritzem l’Educació were campaigning on social media all week, using the hashtag #milifreeedu. You can find their resources here. A week of action that took place in many German towns and cities in September 2012 inspired the first International Day of Action For Military-Free Education and Research on 14 June 2013. This year in Mainz as part of the international week of action there was an info and music stall, in Frankfurt am Main a lecture and discussion entitled The battle for the home front (Der Kampf um die Heimatfront), and in Hamburg a congress 'In Favour of Science and Culture of Peace'. disarm UWE published an article examining links between their university's engineering department and a military project - Bloodhound SSC, and Forces Watch ran a workshop 'Questioning the UK military's 'engagement' with young people in Scotland'. Geneva's Quaker United Nations Office released a report - Education & the Military: A human rights & peace perspective - which questions the presence and influence of the military in primary and secondary education from a peace and human rights perspective. In the USA, the National Network Opposing the Militarization of Youth extended their call to Save Civilian Public Education to encompass the week of action. In South Korea, World Without War hosted an open forum on security education lead by the military. World Without War also hosted a film showing of screening of a Belgium movie Summer with Anton, about a boy from Moscow, who spends his summer vacation at a military camp. See more photos from the various events in Korea here. 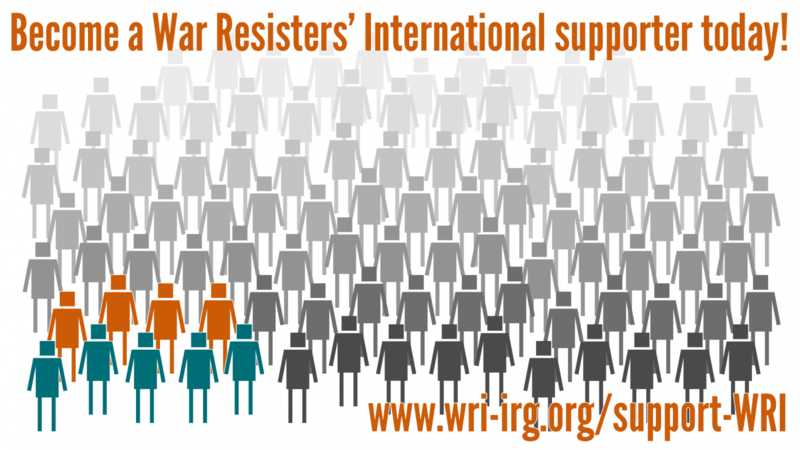 Finally, twenty six groups (from Bolivia, Britain, Colombia, Egypt, France, Germany, Ireland, Israel, Kenya, state of Spain, Sweden, USA and Venezuela) together published a call to action: War is not the answer: resist youth militarisation! The week of action was part of WRI's work Countering the Militarisation of Youth. If you want to find out more about this work, please visit WRI's site http://www.antimili-youth.net/, and write to cmoy@wri-irg.org if you would like to be involved in direct action for youth militarisation in future. Read more about the background to the week of action here.